The vertical composition of this scheme was informed by the existing structural context of the site. Created from two former workshop buildings and a retail unit that were vertically stacked. 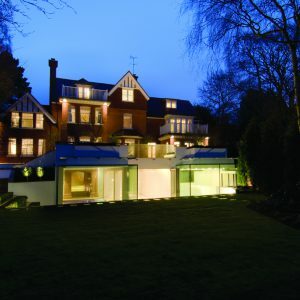 This gives the residence the unique featrure of being completely obscured from the street. LTS used a combination of carefully curated materials and an intelligent spatial arrangement, to ensure that movement and circulation through the property is natural and easy. This philosophy is supported by the lighting approach. Integrated arrangements are used to reinforce the visual structure, and create a coherent, functional internal interior arrangement.